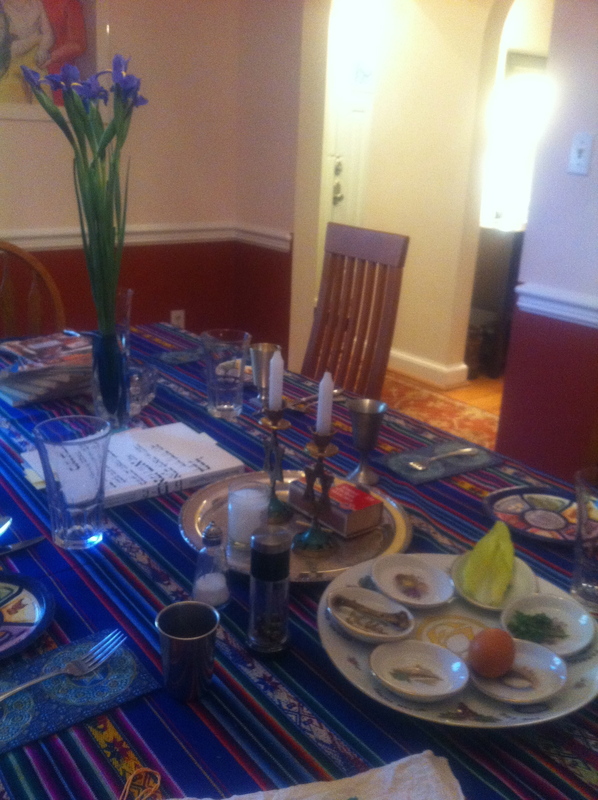 Passover is one of my very favorite holidays because it forces us to acknowledge the power of food! The ritual foods of Passover were specifically chosen to help us connect with our past and with our ancestors. We eat cardboard (err, matzah) because the Jews did not have enough time to leaven their bread when they were fleeing Egypt. We eat horseradish to remind ourselves of the bitterness of their slavery. We eat gefilte fish because… well, no one really knows what’s up with that one, actually. Being the perfume lovers that we are, I like to think that we can forge these connections through smells as well as tastes. So here’s what my Passover smelled like: freshly-grated horseradish, so sharp it burns your throat if you accidentally breath it in. The vegetal greenness of the tulips our guests brought. The celery and carrots in my mother’s matzah ball soup. The bite of Brut in the champagne risotto, my new specialty. The hissing flame of the Yartzeit candle, which we light to remember those who cannot be here. The heavenly smell of lemon juice sprinkled on crispy chicken skin. 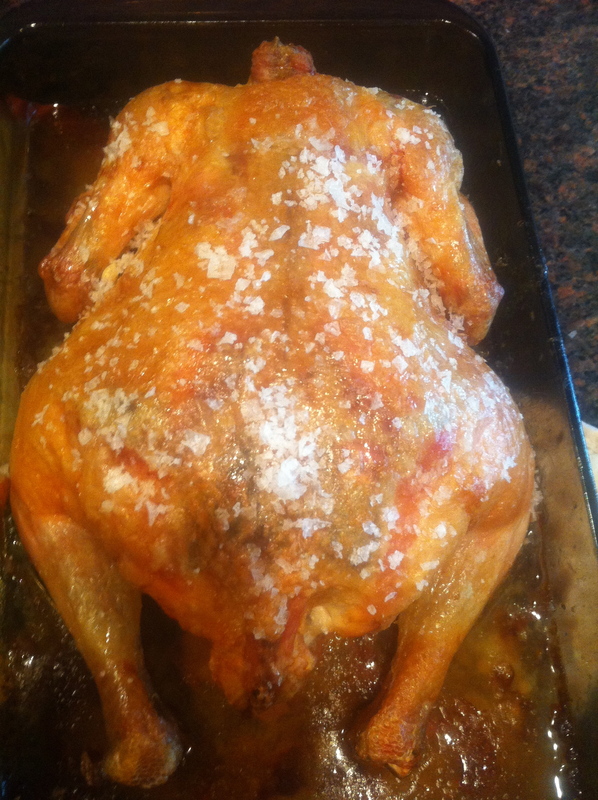 Behold my pride and joy: Nigella Lawson's Lemon Roast Chicken. Now it’s your turn to share! What did your holidays smell like? Mine smelled like vodka infused strawberries & vanilla bean cheesecake b/c the fiance’ & I did nothing all day — okay, okay we watched Thor — and then went out to the Cheesecake Factory. We always have the most low-key holidays. Neither of us are particularly religious despite the fact that he was raised Catholic and don’t have any family traditions, so we just usually drink & go out to dinner somewhere. Your holiday sounds like it smelled divine, though. And that chicken … hnngg. I love lemon roast chicken. Uh, Thor is totally a religious experience. THOSE ARMS. The lemon roast chicken is INCREDIBLY easy to make, and Nigella’s cookbooks are a delight to read. She’s Oxford-educated and a very good writer- I like to consider myself pretty well-read, and I don’t know a quarter of the words she uses! See, I’m more of a Loki kind of girl, myself. I fail at cooking anything, but it looks so delicious. I may have to try. beautiful table arrangement and great smells you had.. Thank you, Irina! My mother has beautiful taste in decorating 😀 Matzah is curiously smell-less. Maybe because it’s supposed to be a completely pleasureless food! We had a few yummy smelly food things. Vegan Curry, Spicy Chicken Strips, Popcorn, Chive Pancakes, Hot Churros. So it was pretty fragrant, although we don’t have a religious household. I did say, “Thank You Jesus!” a few times. CHURROS!!! That sounds absolutely delicious! By the way, I got your thank you note today! It was so sweet, thank you so much! Ours smelled like grilled meat and potatoes! Neither me or my husband are particularly religious and don’t have family close by that celebrates either. So other than me giving my husband a basket of jelly bellies, reese’s eggs, pop rocks and legos, it was just another day. But I did make some amazing steaks on the grill with potatoes and onions in foil as a side. The smell of the onions cooking on the grill is one of my absolute favorites. Uh, getting a basket full of jelly bellies and legos qualifies as a very special day to me! 😀 There’s no smell like grilled onions! Our SedEaster (we’re not religious but we’re trying to do some “themed” celebrations according to either our roots (Seder) or our place of living (Easter)) smelled of a matzah ball soup, a boneless lamb leg roast and Dior’s New Look 1947. I want to mention also that my vSO actually likes matzah and eats it completely voluntarily. Did you wear any perfumes? I really like the sound of the mixed traditions! I’m okay with whole wheat matzah, but by the fifth day, you really can’t take it anymore. I wore Apres l’Ondee- in my mind, Passover is about the good things that come after our various trials. Just want to say thank you again for the introduction to the exquisite Apres l’Ondee through one of your generous draws. It is my absolute pleasure, Linda! 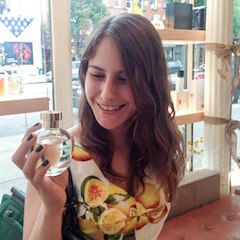 If I could, I would give a sample to every perfumista- everyone should try it! I love lemon roasted chicken! I usually stick whole cloves of garlic under the skin and sliced up lemon inside the cavity. Then it smells oh so good. Also tastes good when you stuff some fresh herbs like rosemary, sage and/or thyme in the cavity with the lemon. Thanks for the link above to the Nigella recipe — I’ll have to try the lazy potato mash.